Zoe Coppola is a recent graduate of the Peabody Conservatory of Music, where she received her Master of Music degree in Harp Performance and Pedagogy. Zoe is now active as a freelance harpist and pianist, therapeutic musician, and music teacher. She currently teaches harp and piano with the Bridges program in Baltimore City, maintains a private studio, and is excited to join Harmonic Music Studios. As a harpist, Zoe has had solo performances at the Baltimore Basilica, Enoch Pratt Library, and Peabody’s Thursday Noon and Road Scholar series concerts. She has performed with the Salisbury Symphony and played principal harp with the Peabody Symphony Orchestra. At Peabody Zoe was also deeply involved with the Harp Adventures outreach program and her pedagogy courses, through which she gained experience in a wide range of teaching and leadership situations. Zoe also holds a Bachelor of Arts degree in piano from Skidmore College in Saratoga Springs, NY, where she received a number of awards, including the Filene Fellow award and Periclean Award nomination for distinguished senior project. 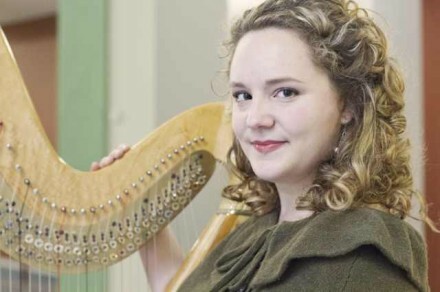 Zoe had long desired to study the harp, but first got the chance to do so as a sophomore at Skidmore. She later performed with the Skidmore Orchestra and Vocal Chamber Ensemble. Zoe spent a semester studying music abroad in Vienna, Austria, where she also taught English at a local elementary school. Following her graduation from Skidmore, Zoe moved to Guangdong Province, China, to teach English at the prestigious Sun Yat-sen University. Remnants from her time in China include elementary Mandarin proficiency and a loving husband. Zoe has studied with wonderful and supportive instructors, including Dr. Ruth K. Inglefield (harp), Ms. Elizabeth Huntley (harp), Dr. Pola Baytelman (piano), and Dr. Richard Hihn (piano). She has received supplemental instruction from a number of pianists and composers from the New York-based Ensemble ACJW, and has performed in masterclasses by harpists Dan Yu and Bridget Kibbey, and pianists Arnaldo Cohen and Andre-Michel Schub.